500 is the number of riders we’re hoping to get. And with money going to the Great North Air Ambulance we hope that as many of you as possible will be able to join us. 500 also happens to be the number of parking spaces we have on site. 145,490 is the number of kilometres covered since the start of the Borderlands event in 2014. That’s 90,683 miles in old money! That would get you more than three and a half times times around the world. 173 is the number of kilometres you’ll actually ride on the 170km event. It’s a real challenge and not for the feint hearted as it has a total ascent of 2,300 metres. On the 100km you’ll actually ride 106kms and it has a total ascent of 1,400 metres. You’ll also get to see some of the most spectacular views in Northumberland and the Scotland Borders. 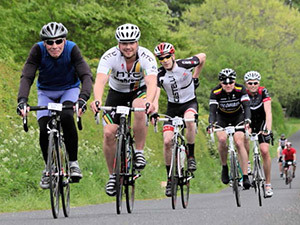 60 is the shortest senior ride and a great way to come and try out a cycle sportive. Although it starts out with a couple of quite challenging hills you’ll get to ride on some of the quietest roads in both Northumberland. 30 is the Junior event for under 16s. With Doddington Ice Cream on offer at the half way point it’s a great way to get youngsters involved. It’s also a great family ride as each child is allowed to be accompanied by an adult who doesn’t have to pay. 7 that’s what time registration opens for the 170 and 100 km rides. So given a good wind you should be back in time for a late lunch or early tea. It’s 7.30 for the 60km riders and 7.45 for the 30km. 9 is the time registration closes so if you travelling make sure you get to us in good time. 70 is the number of marshals and officials we’ll have at the mart and on the route to help you enjoy the day. You can’t miss them they’ll all be wearing rather fetching yellow hi viz jackets. 53 kilograms of jelly babies we get through on each event. They’re a great favourite with everyone they equate to 180,200 calories consumed in total. They’ll also be 40 kilograms of peanuts eaten and that’s an incredible 232,000 calories. 775 flapjacks made for the event by the Great Northumberland Bread Company, 600 hot meals cooked by Brenda’s kitchen including steak pies and bacon butties and 387 bananas and energy bars eaten during the event. So for those still undecided I hope some of the figures help you to decide to come and give it a go. The 1,303 people who’ve been before had a great time and I know you will too be supported all the way around the route. For more information, go to Borderlands or to enter go to British Cycling. Entries for the Wooler Wheel Borderlands Cycle Sportive close on May 4th.